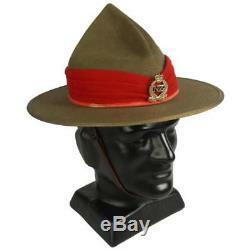 New Zealand Army Lemon Squeezer Hat. A genuine and iconic piece of New Zealand Army surplus - the lemon squeezer. Lemon squeezers were first brought out during WWI, originally for the Taranaki Rifles Regiment but was adopted by the rest of the NZ infantry in 1916. This is a more modern version of the hat, most likely dated around the early 2000's. This is a one off piece of surplus, get it before it's gone! Felt wool hat with a leather headband and chin strap. 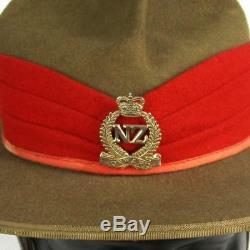 NZ Expeditionary Forces "Onward" badge on the front. Manufactured by Westminster Treister (as detailed on the head band). Condition: Very good and usable condition. Minor wear around the headband but all labels are readable. Australian domestic orders are all sent by Toll Priority and all international orders are sent by NZ International Air - Untracked. Army and Outdoors (previously Kiwi Disposals) is a New Zealand based company that has over 30 years of experience in the army surplus business. We stock the largest range of military surplus in the southern hemisphere. You can find more sizes, variations and products both online or at one of our retail outlets. The item "New Zealand Army Lemon Squeezer Hat" is in sale since Monday, September 3, 2018. 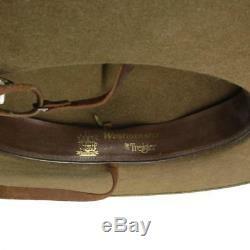 This item is in the category "Collectables\Militaria\Other Eras, Wars". The seller is "armyoutdoors" and is located in Christchurch. This item can be shipped worldwide.